I think this week’s mini missions just about cover the basics of decluttering your kitchen. But I shall make a list of suggestions here just in case I missed something. Get rid of ingredients you haven’t used in a long time. If you want to improve your diet but suffer from lack of self control then declutter ingredients and prepared foods that you should not be eating. You could do a use-it-up declutter mission on these items, sparingly of course. There is no need to rid yourself of these items altogether just ration how much you stock and how often they are replaced. Declutter gadgets and small appliances that aren’t doing much more than wasting space. Be rational about how many cups, plates, bowls, glasses, knives, forks and spoons you need. Do a trial separation if you aren’t sure. That is, pack up what seems like excess and move it away from the kitchen. If you don’t find yourself retrieving any of it them perhaps you don’t need it. It has been written more than once that the cluttered state of a house can be assessed simply by viewing the front of one’s fridge. You might want to keep this in mind while you are decluttering the rest of your kitchen. Once all the clutter is out of the way rearrange the items you use regularly so they are in the most convenient positions. You might also want to consider moving items you store in your kitchen that aren’t in keeping with the purpose of the room. If your space is limited and your kitchen has to be multipurpose then a compromise might be necessary, but best that kitchen is primarily organised to be used for food preparation. If you eat at the breakfast bar then it should not be covered in school papers, things needing repairs, kids toys and bills. Factor this in while decluttering to make a proper space for these items if necessary or find another more appropriate place to organise these things in your home. Continue to observe over time if what is left is used often or seldom and consider decluttering some more. There are circumstances that affect the quantities and variety of things one needs in a kitchen. What suits my circumstances and what works for your family could be, and I am sure are, two entirely different situations. For instance, I have a dishwasher and a family of three adults so I keep enough cutlery, crockery, glassware and utensils to cater for washing a full load and having enough left over to use while the others are getting clean. You however may wash by hand or have a split drawer or small bench top dishwasher, four children or live alone so the numbers will be different for you. You might bake a lot so need a variety of pans and a sturdy mixer while I could live with fewer and mix by hand. You may have a Mediterranean diet and regularly use a pasta maker, while I have long since decluttered mine because we eat low carb so pasta is only a special treat that we have infrequently. You may enjoy a little French treat and often serve crepes for dessert. I am not at all French however I am not parting with my crepe maker because I love crepes too and make them often. Only on Saturdays of course because that is “Anything Goes” food day at our house. You may enjoy spicy food so require a large spice collection. I also love spicy food but have simplified these days and use prepared curry pastes. When the spices I have run out, there are many I won’t be replacing. So as you see your kitchen may be stocked quite differently to mine but neither need to be cluttered with unnecessary things we don’t use. If there is a particular something that you enjoy only on occasion, do you really need the specific pan, gadget or utensil to make it yourself? Especially if that something is a treat that isn’t so healthy for your diet, perhaps ice-cream, cookies, cakes, crepes, donuts, deep-fried anything… Wouldn’t it be better to only indulge in these treats occasionally outside of the home rather than having the ingredients and equipment to tempt you to eat them too often. By decluttering these items you not only reduce the clutter in your kitchen but you also declutter unhealthy options from your diet and free up space which makes your kitchen easier to function in. And remember a treat seldom enjoyed is enjoyed all the more. Trust me most of these gadgets are easily replaced at a thrift shop for a few dollars should you suddenly decide you actually have a use for one. That’s because the majority of people usually come to their senses and donate them sooner or later. I have decluttered my kitchen slowly over time. No surprises there I suppose! 😉 Items continuously kept coming to the fore that obviously weren’t being used, not used often enough to warrant keeping, or that I realised I had more of than I needed. This will continue as the kids leave home and at that time I will give stuff to them if they want it. Right now I have a shelf of various glasses and some excess Tupperware canisters that my daughter will be taking. Aside from that I am pretty happy with the shape my kitchen is in… for now. So be realistic about what you need, use and are likely to use in the future and considered decluttering the rest. If you must use ziplock bags wash them out and reuse them, rather than wasting them after only one use. I don’t use many these days because of changes in habits but when I do I wash them and then dry them by hanging them open side down on the fridge placing a magnet on the top inside edge to keep them in place. You make a good point here Andréia. Doing things the hard way can have a positive effect on minimising the number of times one indulges in something they maybe ought not. I also applaud the fact that making your own would reduce the amount of packaging one brings home. However popcorn can be made in a regular saucepan with a lid, that is how I made it as a child before microwave ovens were invented. I was not even aware that they made special pans just for this process. 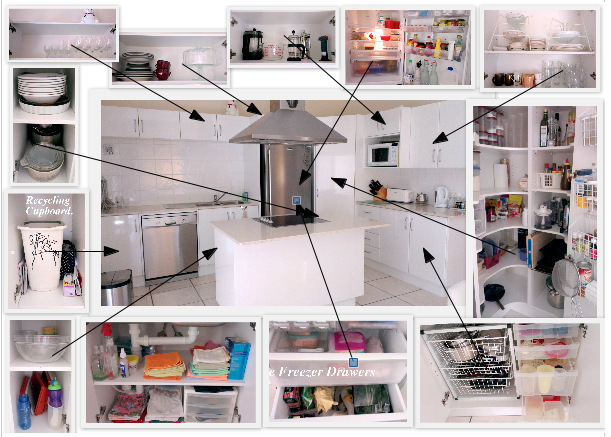 Thank you for sharing the intimate look inside your cupboards! It is something I can aspire to. I know what you mean about the treat gadgets. I got rid of our deep-frier years ago because I hated cleaning it with a passion. Frankly I prefer eating fried stuff as a restraunt treat (only ocassionally) because A: I can’t make it like that at home and B: I don’t have to clean up the spatters and messy cooking things. Worth the menu prices there! I’ve also resisted getting an icecream maker even though I know home-made is infinitely better (and better for you), but then I would be tempted to eat icecream more often! As it is, I know only the really nigh end natural store bought brands are worth eating and they are expensive enough that I only get them once in a blue moon. The cheap stuff never comes into the house because the ingredients scare me a little 🙂 Same goes for those donut hole making appliances. Cute idea but bulky, unitaskers that only encourage me to eat more junk foods! Not in my house thank you very much! I’m with Andréia above too. Popcorn made in the pot is better. I didn’t buy a special pot though…. a heavy bottomed large pot with contant movement works great. A bit of a work out, true, but then the popcorn tastes even better because I “worked for it”. LOL! Also, when you fry in the house, the smell lingers for days. What a smart lady you are Creative Me. It seems you and I follow much the same system. Mostly only eat naughty out and buy the good stuff because the price will limit how much is eaten. Creativeme – I too prefer treat food to be part of the experience of being at a cafe or restaurant. Sure there have been some cafe ideas that have made it onto our family menu but they tend to be more on the wholesome savoury side of the menu. I feel it is better to succumb to a piece of decadent German chocolate cake while meeting a friend for lunch, rather than me having an entire though inferior version at my finger tips in the kitchen. That’s not to say we don’t have treat food in the house, but I prefer to make stuff at home that I can resist. You have a great kitchen and have done a great job on decluttering it. Keep your fingers cross everyone that I can get Mom interested in doing more with ours. Oh, Rachel W, do I understand. Our kitchen isn’t bad. It’s not overcrowded with stuff. The counter tops are clear. It’s just that we don’t need so much of this stuff we have and I can’t see why we keep it. We have items that we brought here with us almost 5 years ago that we have never used. So why have them? My mother doesn’t feel like having company for dinner much. When she does we usually have soup and salad because it is better for everyone and most of our friends eat that way like we do. We don’t need all those baked goods and neither does anyone else so she shouldn’t be baking things for us or for giving away. Put it all together and we have a number of cooking items that we could declutter. We have a bunch of spices that are years old and never used too. Sigh!!!! Just remember though Rachel W, if you don’t ask you won’t know the answer. She might just surprise you. For a short period when my kids were younger they used to say ~ “It might be a stupid question but can I have …” I would always say ~ “The only stupid question is the one that isn’t asked.” They soon stopped prefacing their requests with those words. We have three sets of pots. THREE. We can use all of them…if we don’t do dishes for a week. Which would be gross. I have broached the subject with my mom recently but so far no headway has been made. I do remind myself the kitchen isn’t nearly as cluttered as it was even a year ago. Slow progress is still progress, right? We constantly battle counter clutter creep. It is difficult because we regularly use the appliances on the counters – the coffee pot, electric tea kettle, toaster oven, microwave, rice cooker. I realize that since we use them, they aren’t really clutter. But it looks cluttered. I really like empty horizontal spaces. There are other things I’d like to declutter though. Like we have three sets of pots. And we have this griddle pan thing that HAS never been used. On the plus side, we went through our spices not that long ago. I got most of the say in what stayed and what went because I do the majority of experimenting with spices and herbs. My mom is more of a cayenne pepper, garlic powder, and onion powder sort of cook (which is not a complaint on my part…I love her food). I wonder Rachel W, would she be willing to try the trial separation idea. You could hide one of the sets of pots away, agreeing together about which set, and see how that goes. If no-one misses them then maybe she would allow you to eliminate them. Cindy has sent me a post for this weeks Fri Faves about gradually changing habit being easier on people with hoarding issues. Perhaps you could adapt some ideas from it to help bring your mother around to a different way of thinking. Surprisingly enough (Not) the experts in the article suggest the best way is slow and steadily. Imagine that. Fingers crossed here for you Deb J. Your kitchen is beautiful, Colleen. I had a white kitchen before we moved. I miss it because I loved the brightness of it. I cook a lot at home during the week and try to only eat out once a week on Saturday, usually not more than that. If we reserved some treats for only when we eat out, then that in itself will definitely help get some things out of the kitchen. You can find a gadget or small appliance for just about any food item that you can make in the kitchen, but I have found that they do not always make the job easier. Let us not forget about decluttering those cookbooks. Maybe I am the only one who actually still has some of them, but it is worth taking a look at. Thank you Jen, I had forgotten about the cookbooks. Probably because mine are long gone. I only have too, the self-made one with all the old family recipes and the new ones I have added and a Jamie Oliver one my daughter gave me. I will let her have it when she moves into her own place soon. Great idea about drying the baggies on the refrigerator. I have a baggie drier that I’ve had for years, but every now and then, I have few too many baggies and am always perching that around the kitchen in goofy places where they are invariably in the way. I am intrigued Cindy, can you actually buy a baggie drier or is this something you rigged up for yourself. Anyway, this is a GREAT post, and one I’m going to come back to when I have a bit of time to mull over it; so many things to consider! I decluttered the waffle pan a while back as much as we all love waffles, each one took 5 minutes to make, and so breakfast would take well over an hour! I do have a specialist crepe pan as we have crepes weekly. Like you, I make popcorn in a saucepan. It’s 1/2 the fun, seeing the kernels pop through the glass lid! And i cook them in coconut oil so they’re relatively healthy. Could not do without my cherry red Kitchen Aid, as we make bread and pizza dough every week, and I still bake for the kids (sometimes). I’m in 2 minds about keeping the big blender on the benchtop: if it’s there I’m prompted to make smoothies, but if it’s packed away, I can’t be bothered getting it out. Hi Loretta, I used to have dark bench tops once and they showed every crumb that was on the surface. What was worse was the tiled bench top I had in the US. Grout and food what a unadvised combination. Imagine how happy I was to end up in a home with these off while bench tops. I love them. Like I said Loretta, I can tell you eat in moderation. Your sourdough sounds good. How do you serve crepes, we usually either have the “healthy” version of Lo GI caster sugar with lemon juice or the “very naughty” version of nutella and whipped cream sometimes with slices of banana. I’m a mean mum: Nutella has been banned from our house since I realised the first ingredient was sugar, about 5 years ago (plus I hate the taste anyway). I serve crepes with lemon and sugar (usually coconut sugar), sugar and cinnamon, or my husband’s apricot jam (which has 1/3 the amount of sugar of normal jams and is delicious). Sometimes we have stewed apples, or I heat up some frozen berries. The kids usually manage to sneak out the bottle of maple syrup too. I’m also partial to a savoury buckwheat crepe with goat’s cheese, oh yum…. PS I just made a batch of ginger beer so I’ve finally decluttered the kitchen bench of heaps of plastic bottles and my ginger starter. I have resigned myself to the fact that my kitchen will rarely be uncluttered as the 4 of us always eat at home and we cook dinner from scratch almost every night, so I like to have some stuff handy. One day though! Hi Loretta, decluttered is what works for you. I also cook from scratch most nights but I keep it pretty simple so I don’t need much stuff. Love your kitchen Colleen and at first until I scrolled down I thought it was from a home magazine! Live and learn hey, Megan S. I too have been there and done that. Luckily for me I usually purchased these things for next to nothing at jumble sales, yard sales and thrift shops in the first place, so not much money was wasted. Isn’t it incredible how much space we can waste while all along the only thing we needed was the knife we already owned. I have been considering some serving bowls in a pattern different from the dishes we are now using and the more I read these posts, the closer those bowls are to going right out the door! We seem to have a lot of utensils. Fortunately, not too many small appliances. Colleen, your kitchen is a breath of fresh air! I’m thinking a visit to Ikea to see some drawer organizers might be in store for me. Some of the drawer bottoms are coming apart and we can’t afford new cabinets/drawers, but there is a cabinet company in town that I’m wondering if they can fix the bottoms. But hey! I did post last week about getting rid of some ancient spices so there is a positive thing! Hi Michelle, send me a list of the cleaning supplies you have and I well tell you which ones you don’t need. The main ingredient for my all-purpose cleaner lives in my pantry, it is a jar with lemon rinds and vinegar. To that I add water and dish soap. I don’t have silver cleaner, that is nasty stuff. I eliminated the need for this by getting rid of all the silver items, aside from jewellery, that I own. The jewellery I clean in a glass bowl with a little aluminium foil a little not water, a teaspoon of bicarb soda, a drop or two of dish soap and a dash of vinegar. I use microfibre and water to clean all my glass inside and out. I use the vinegar again instead of fabric softener. We do have a collection of shoe polish which is kept in a small tackle box. I could go on but you have inspired me to do a post on the cleaners I keep in my home. I do sympathise about the repairs that need doing to your kitchen. It always seems harder to perform your daily tasks when the difficulty level is raised by the condition of what you have to work with. When I am looking at moving into a home the only things I am usually interested in is what condition the bathrooms and kitchen are in. Most other areas can be improved with a lick of paint or a good piece of furniture but kitchens and bathrooms can get expensive to fix. Colleen – I had a quick squizz thru the post this morning while trying to gulp down a hot drink and herding kid along to get ready for school. I didn’t click that it was your kitchen, I thought you’d grabbed a picture from a magazine or something. 🙂 Its a lovely kitchen, I love the white. I have no deep fryer, pie maker, cupcake maker, ice cream maker, slushy maker etc. The nearest thing I have to these would be the toasted sandwich maker that was an engagement present 20+ years ago and still goes great. It really only comes out in winter and maybe on the odd Friday night when I don’t feel like cooking and if the kids want messy fillings. My rule of thumb for buying a specialist food maker item is this: I have to make the item by hand 5 times first. Usually by the 2nd or 3rd attempt I have discovered (a) I like the shop version better or (b) it has only been a passing phase and interest has waned already. Moni – I like your “rule of thumb”. That is a great idea and I will keep you in mind when I make a new receipe! Hi Moni, you will notice I didn’t mention toasted sandwich makers because they are such a useful item. I actually have a penini press now after my sandwich maker died from being in storage too long. I bought it at the thrift shop for $5. No only can it make toasted sandwiches but it can also cook french toast on both sides at the same time. It can also be used for cooking meat patties, bacon or even a steak if you want to. Of course most of these things we only have on “Anything Goes” Saturdays of course. I like your rule of thumb when it comes to buying gadgets. Clearly it is working or you would have more than a sandwich maker. Glad you like my kitchen I like it too. It has only one real fault and that is that there is no room to the right of the sink to put the dirty dishes on. One need room on both sides of a sink, one side for dirty and one side for clean. Luckily we have a dishwasher in fact the fault with the sink is the only reason we do. Colleen – If Adrian wants a steak toasted sandwich I just use the frying pan, but the kids prefer the encased kind. The last kid to leave home can take it with them, if it is still going. It doesn’t fit the theme of unhealthy food machine but they are on trademe and ebay by the dozen. George Foreman grill. I still have my family size one which doesn’t see a lot of action. I have a friend who would like to swap it for her small compact one, but I need to ask a few questions first, otherwise it might be better for me to just give it to her outright. My daughter prefers the encased kind too. Did they used to call them Jaffles over there. That is what the sandwich maker was called when it first came out here – a Jaffle Iron. Colleen – for some reason I know the word Jaffles but would never have picked it to be another name for toasties. Possibly because I have a lot of Australian relatives. Do you think it was a play on waffle iron? I remember camping in the early 80’s and using a camping one over the fire – it took a long time! My parents had one of these old time ones for in the camp fire when we were kids. Colleen – yes that it, though ours was rectangular and had two sandwich capacity. Love your kitchen Colleen! Thanks for sharing with us. Several years ago my mom was in a kitchen decluttering phase and she (smart woman that she is) put all her utensils and pots and pans – pretty much everything in boxes in her pantry Then she took out what she needed to use that day and put them away after she used and washed them. Each day she’d take only what she needed out of the boxes. After a month, most of the boxes were still full of duplicates, stuff she thought she needed……. Since they were already boxed up, it was easy for her to pack ’em up and bring ’em to Goodwill. After a year – she only regretted parting with one item – and it was readily replaced at a thrift store. Hi Cristine and welcome to 365 Less Things. It is a good kitchen and the dining area is right in front and the living room within earshot so it is great when entertaining. And now that it is nicely decluttered it is very functional too. I have heard of people doing what your mother did. I think it is a clever idea. When we moving into this house and discovered everything we owned wouldn’t fit, I scrutinised everything as it came out of the boxes that we didn’t unpack immediately. Some went straight to the garage for a garage sales while other got put away. Or I should say crammed in somewhere. But I knew what had to go and slowly but surely they did, plus some. Then plus some again. And again. I still use the garage as my trial separation area. Not that I do that often because I am usually good at making immediate decisions about things. But every now and again there is something I am not so sure about. So out in the garage it goes to the donation box while I decide whether I miss having it or not. It is usually not. Love the idea of having a “trial separation” area. So many things could be done that way. You bet they can Deb. The deep fryer is going out the door this week. I haven’t used it in forever since I bake everything in the oven and, like Cindy said, I hate the way it makes the house smell for days. Although, I did ask the husband if he wanted it anymore and the answer was a definite “No”. I think that the person who does the majority of the cooking should really have the say of what stays or leaves the kitchen. I am not saying that other people in the house should not have input on the decision, but the person who is in the kitchen the most, knows what works and doesn’t work best. Similarly, the main user of the kitchen should get input on all purchasing decisions. My dad went through a phase where he’d buy a new dish set each year, and it drove my mom nuts trying to store them. My mom bought us a juicer last year, which I thought would be clutter, but then we realized that we could use it as a noodle extruder. My husband makes noodles almost every week now. And we’ve been making a lot of delicious fresh warm cider. And sometimes I manage to make juice lunches, which was the intention behind the gift. Fair enough Jen. Get that thing our of there. We have a little hot air popcorn maker – no oil required and it makes a ton of popcorn for a few cents. Handy for a cheap healthy snack when the kids were younger, but it hasn’t been used for a while – so maybe it needs to go now. But I swear by my Tefal egg’n’toast toaster. It makes it so easy to poach an egg for breakfast and the extra protein fills me up all the way to lunchtime, so I don’t snack! I guess one person’s useless gadget is another person’s essential item. The important thing is to actually THINK about this stuff instead of just blindly stuffing the cupboards with crap. Calico Ginger, I had no idea there was such a thing as a Tefal egg’n’toast toaster. I have to say it isn’t a bad idea and relatively healthy. I do avoid having toast or sandwiches most days though as bread is hi carb. Although I grainy bread would make it somewhat more healthy. Once all these people leave home who insist on white bread I may have grainy toast and an egg more often. Calico Ginger – I saw one in the shop the other day and it made me smile. One of my work mates and I were discussing a similar topic last week – he’s married to a minimalist and is the main cook in his household – the conclusion that we came to was pretty much as you said one person’s gadget is another person’s essential kitchen item. Some things we both owned and some things one did and one didn’t own. But the theme that came thru is that we both could rattle off all valid reasons and recipes for the gadgets we did have. So if its getting used regularly, it is justified. Kitchen envy! Beautifully streamlined place, Colleen!! Oh well, the cupboards shut and it looks fine from the outside. Whatever works for you Sanna. lovely kitchen Colleen! I envy your ammount of work surface, as my kitchen is only 4,5 m² my total amount of worksurface is about 1m² (and it is divided into 3 parts). Oh, well we manage, but we keep our dishes and cutlery in the dining room. BTW it looks like you have a very practical kitchen, great work triangle, and I do understand the nuisance of having a one sided sink. Hi Hunter_xs, I think if I had a smaller kitchen I would just get rid of even more stuff. I enjoy the challenge of making things work when their design isn’t very practical. After living in quite a few houses throughout my life I am constantly surprised, or maybe appalled would be a better term, at how badly arranged some homes are. This one is probably one of the best we have had although there are a few little tweaks I would do here and there were it my own.